Several weeks ago, when parking at the West Wind Inn, I noticed a really interesting tree. I took the time to take photos of it because I wanted to find out what kind it was. I asked several people and nobody knew the name of it. I have searched online, through pictures of tropical trees, off and on since that day, but had not found it. Since we've been getting a nice rain this afternoon, and I've also been suffering from family withdrawal, I busied myself with more research to find the aforementioned tree. Finally my investigation paid off! 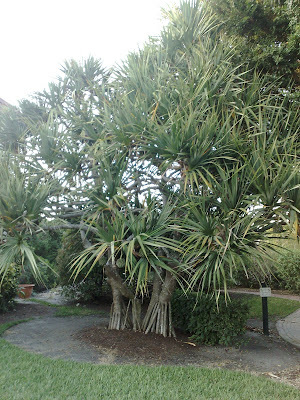 I believe it's a Madagascar Screwpine, (Pandanus utilis). I couldn't find any reason at all for the 'pine' part of the name, because nothing about it is similar to a pine tree. It is grown in tropical climates as an ornamental tree. Evidently there are male and female trees. The male trees have 2-3 cm long, fragrant flowers that are surrounded by narrow, white bracts. The tree I was looking for was the female tree, which produces flowers with round fruits that are 10 to 20cm in diameter, and have many prism-like sections that are seed pods. This gives them an appearance similar to the pineapple. The seeds or nuts, are edible when roasted; and have a taste similar to the pecan. The heavy heads hang from stout branches and can remain on the tree for over 12 months, until they ripen. Seed pods can produce 4 to 6 plants and propogate easily in moist sand. They are sometimes grown from cuttings. The large, light green leaves are spirally arranged on the stems. They are usually 90–150cm long and 5–7cm wide, with small white upturned spines along the leaf edges. The leaves are sometimes used, by slicing the leaves into strips and weaving them into craft items. Stout prop roots are formed from the stem, which helps hold the tree erect and firmly anchor it in loose sand. Screw pine is sand and salt tolerant and can withstand strong winds. They can be grown on dunes to help bind the sand to prevent wind erosion. They are also used for windbreaks to protect other trees and plants that are less salt and wind tolerant. After the tree mystery was solved, I looked outside and this was how the sky looked. By then, the rain had stopped. 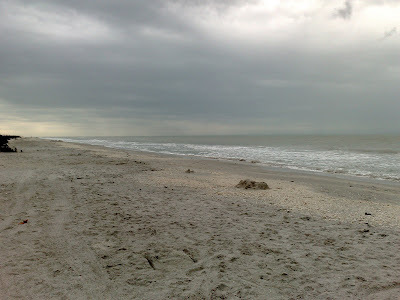 Went to take a look on a West Gulf Beach, but it started lightly raining again, so I didn't linger other than to take a few quick photos. 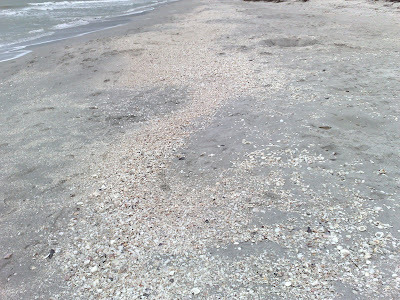 There was a scattering of shells at the high tide line. 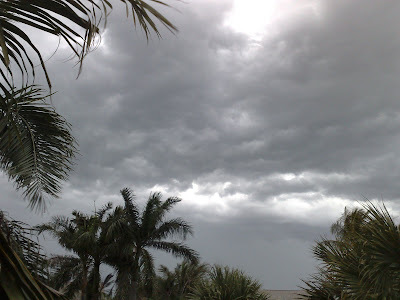 I believe another cold front is passing through, because it was very windy and was getting chilly around 68 degrees. A pretty big change from earlier today, when it was 83 and sunny. Much better in HD on YouTube by clicking on screen below. Glad you found out what it is, Tootie. I did a tree post today also--and showed the fruit from the female trees. Glad also that you all got some rain. My friend in Fort Myers said that you have been in a drought. Enjoy your QUIET house tonight.. I know you miss your kids. We're going to Texas on Thurs. to see some of mine. YEAH-RAH..
What fascinating trees! 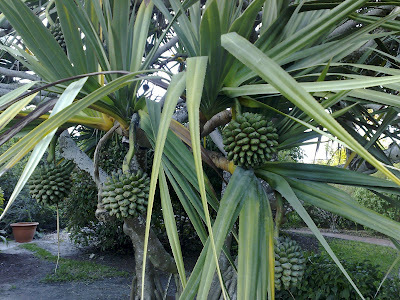 Perhaps they are called screwpines because the fruit somewhat resembles pinecones? LARGE pinecones! LOL! You are so clever to have found them! Our weather today looked much like yours - it is pouring out right now and should continue through tomorrow. I just can't wait to get onto my trip! I'm SICK of this house! That's a really neat tree. I think I might have seen some of those when I was in California. Man, that's a big storm brewing. We don't get big storms here very often. They kind of scare me. Very interesting information about this strange and beautiful tree. Thanks for sharing. 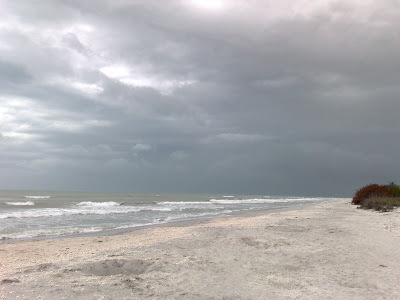 The sea looks so beautiful after the rain. To me it looked line a combination of a palm tree and a mangrove (because of the prop roots). Glad you found out what it was. Wish we had gotten more rain at our end of the island! I never saw such a tree.Really neat looking!I it native to Florida? Cool tree! Melli took the words right out of my mouth...the fruit looks like a gihugic pinecones!